Back when I first got into collecting, in the early '90s, custom figures were all the rage. Are SWCA readers familiar with custom figures? Put simply, they're Star Wars action figures that have been modified in some way, to either improve their appearance or make them represent totally different characters. The vintage line doesn't include a Grand Moff Tarkin figure, right? Well, there's nothing (except the threat of public ridicule) stopping you from making your own! Today it seems that figure customizing has been relegated to its own distinct zone of the hobby. I know few vintage collectors who seem interested in customized items -- who either make them or buy them to display with their collections. But around fifteen or twenty years ago, the vintage and customizing hobbies were interwoven. It was hard to visit the old rec.arts.sf.starwars.collecting newsgroup without encountering customizing discussion. In fact, there was so much customizing discussion that, when rassc split, one of the resulting splinter groups was called rec.arts.sf.starwars.collecting.customizing. There was a lot of customizing content on the '90s web, too. In the early days of the The Star Wars Collectors Archive, the most popular gallery was the one devoted to custom figures. Many people would send emails to the editors commenting on the creations featured there or requesting details respecting their makers, components, etc. Those who remember customizing in the way I do will likely be interested in the above-pictured issue of Famous Monsters magazine, released in early 1979. What finally drew my attention to this magazine? 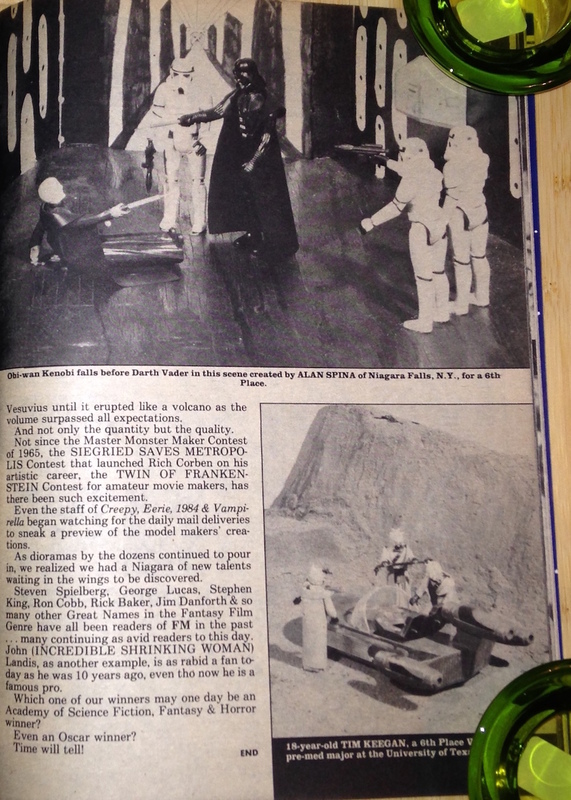 Well, I came into possession of some original material related to the referenced Star Wars contest, and that led me to seek out this particular issue. The material consists of black-and-white photographic prints. Apparently, "FM" editor Forrest J. Ackerman kept these prints on file until he passed away in 2008. They're 14" x 11" blow-ups of the images sent to Warren Publishing by the contest entrants; some were even used to generate the actual images printed in the magazine. 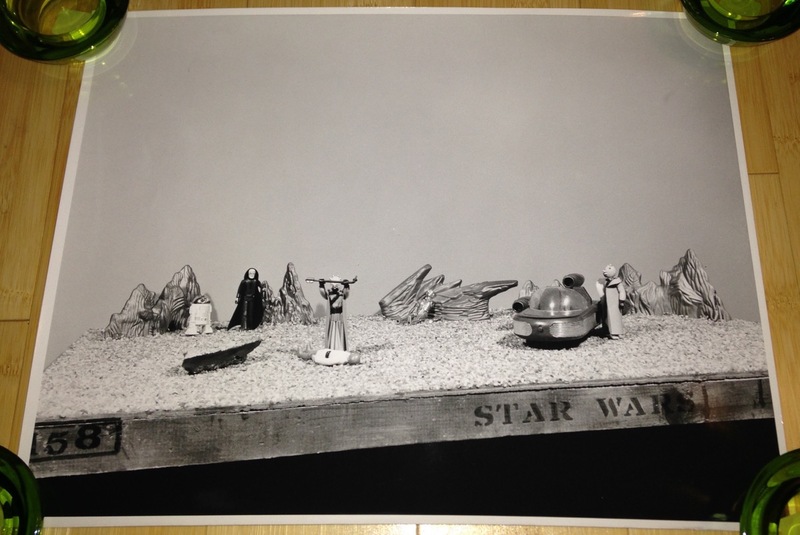 The contest challenged "FM" readers to create Star Wars-themed dioramas. 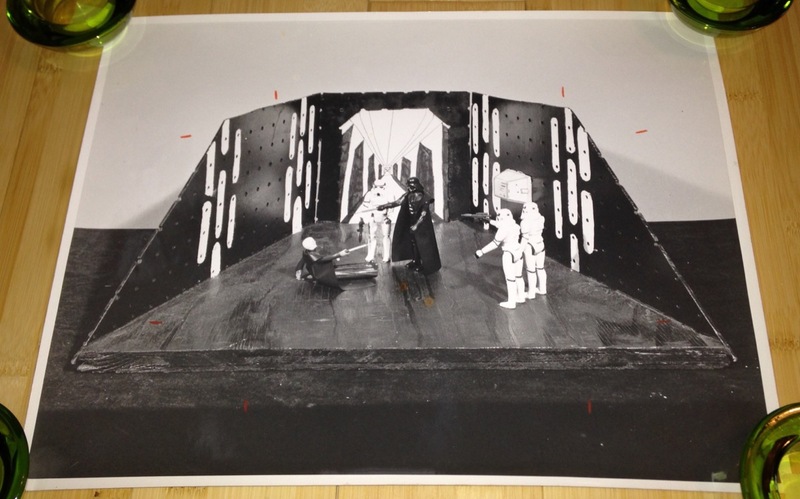 And since the Kenner action figures were omnipresent at the time, many of these dioramas featured them front and center. While most of the figures in the photos aren't customized, the DIY aspect of the dioramas encourages me to view these as some of the earliest artifacts of the customizing hobby. Above you see one such photograph. It features several of the original twelve figures along with a kit-bashed vehicle, which appears to feature guns drawn from MPC's model kit of the X-Wing Fighter. 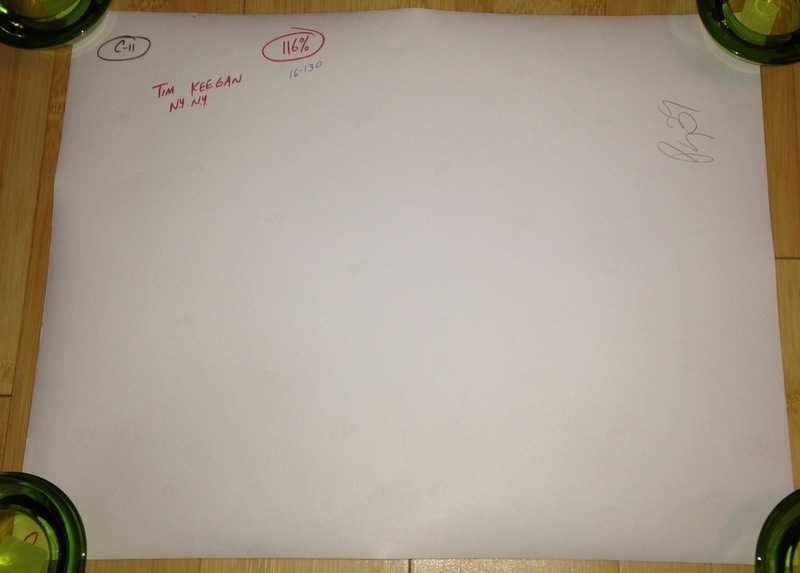 The reverse of the photo features a hand-written letter from contest entrant Steven Simak of Brooklyn, New York. 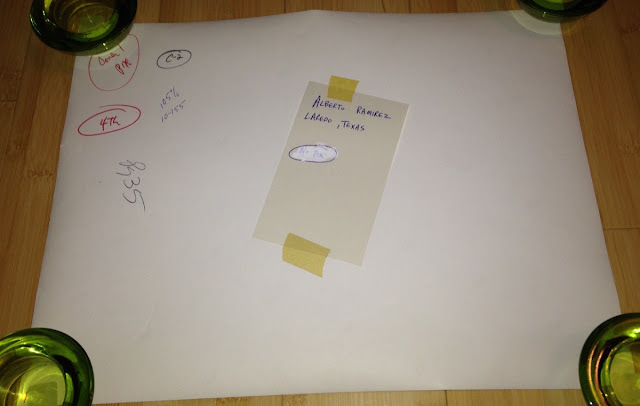 For those of you too young to know about "letters," they're these things people used to make when they wanted to "communicate" and "send fan mail to Burt Reynolds." As you can tell by reading the notations, Steven placed fifth in the contest. The photo was blown up by 102 percent, and it was featured on page 35 of the magazine. Here's a shot of Steven's work from a slightly different angle. This one wasn't used in the magazine. Interestingly, the version of the Luke figure featured in this photo appears to be the one with "brown" hair. I always associate that version with the Empire Strikes Back phase of the line, but this particular example was purchased no later than 1978. Another angle. In this shot you can clearly see Chewbacca lurking behind the faux rocks. Apparently, he's hiding from the Stormtrooper, who seems to have it in for him. 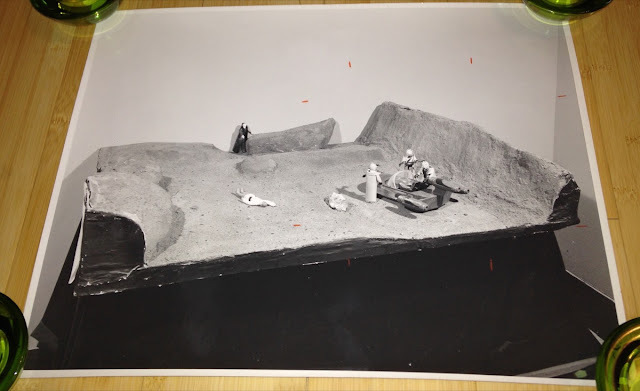 Hey, Steve: Why no Obi-Wan Kenobi in your highfalutin' fifth-place diorama? That is some ageist s**t, bro. 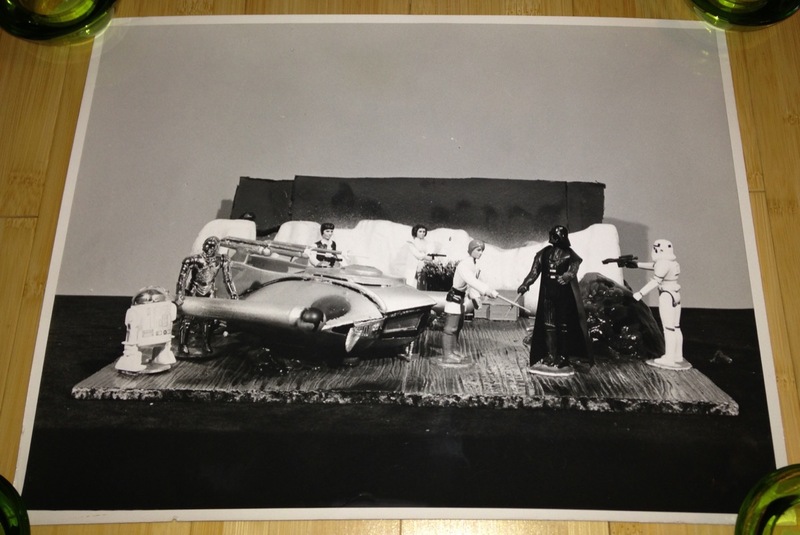 Actually, now that I think about it, this diorama may represent a speculative post-Star Wars scene: the moment when Luke and his bizarro car of the future finally face off against Darth Vader! If so, Obi-Wan was already in blue heaven playing shuffleboard with Hayden Christensen, and had no time for such shenanigans. 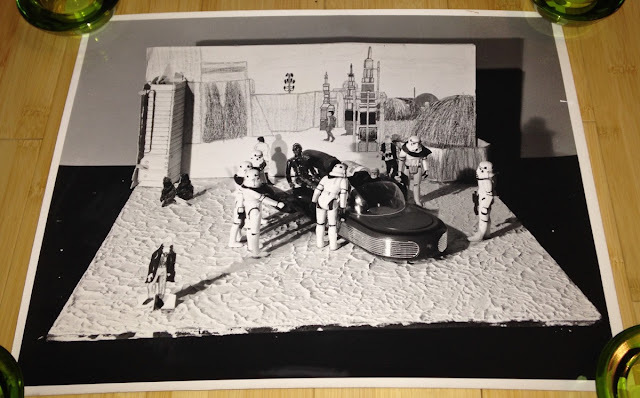 This diorama, depicting the scene in which Obi-Wan saves Luke from the Sandpeople, was created by Tim Keegan, who hailed from New York City. If you look closely you'll see several marks made with an orange grease pencil. 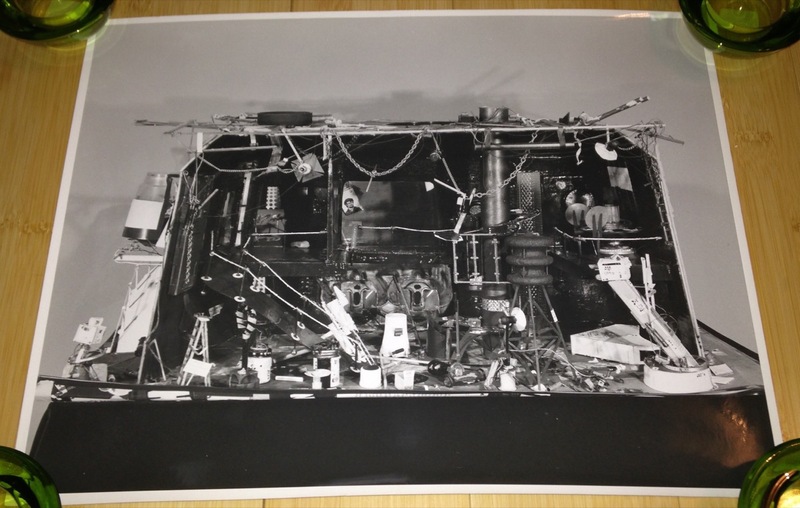 These indicate the portion of the photo that was used for publication. Only the vignette of the Sandpeople rifling through the landspeeder was printed in the pages of "FM." Here's the reverse of the photo. It was featured on page 39 of the magazine. Another shot of Tim's work. When Tim saw the magazine, you can bet he was a little annoyed that the photo chosen by Warren didn't make it evident that his diorama depicts the cave in which R2-D2 hides and watches while his friend Luke is being ruthlessly beaten by desert savages. You know, it gets lost in the rush to praise R2's supposed bravery and stalwartness, but the little jerk really blew it here, didn't he? As later films in the series made clear, R2 was equipped with a taser, a buzz saw, rocket jets, and probably a dozen other utilities capable of inflicting serious corporeal damage. He couldn't scoot up to these mofos and, I dunno, do something? Think about it: The wussiest character in the series, C-3PO, was apparently right there in the fray, as is evidenced by the significant injuries he sustained during this incident. Yet when things got hot, and the fists started flying, R2 simply rolled away, like the ignominious piece of space furniture I've always suspected him of being. Tatooine scenes were apparently favored by the contest entrants, perhaps because it's fairly easy to make a base that mimics the desert. This particular diorama features a scratch-built escape pod. It doesn't appear to be scaled to the action figures, but then neither was the version included with Kenner's Land of the Jawas playset. Another angle. I don't know who built this diorama. It didn't win any prizes. I'm guessing prints were made because this was among the entrees considered for awards by Warren staff. Your guess is as good as mine on this one. It appears to represent a film set. That's a camera on the right side of the image, and there is a little picture of George Lucas on the far wall. Here's another angle. Like the previous diorama, this one didn't win any prizes, and I don't know the name of its creator. 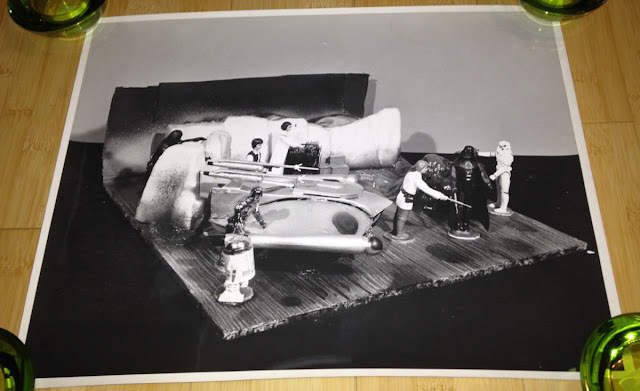 Of the dioramas of which I have photos, this is the only one to forgo the use of Kenner action figures...although it seems like a Jawa should be rummaging amid that mess somewhere. 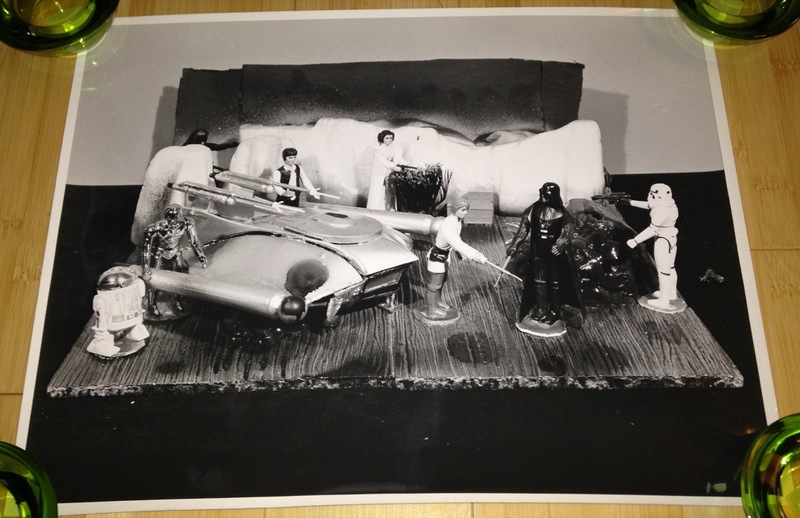 This diorama, however, features plenty of figures: three Stormtroopers, Darth Vader, and Obi-Wan Kenobi, to be precise. The construction consists of nothing more than a painted wooden base and some peg board, but the perspectival drawing of a corridor that adorns the back wall gives it depth and character. Once again you can discern the marks of an orange grease pencil. They reveal the manner in which the image was blown up and cropped for use in the magazine. The reverse reveals that it was created by Alan Spina of Niagara Falls, New York. It tied for sixth place in the contest. I'm not familiar with an Alan Spina, but Tom Spina is a guy who was active in the customizing hobby back in the '90s. Today he runs Tom Spina Designs, an outfit that does, among other things, first-rate restoration, design, and fabrication of real and replica movie props. Here's another take on Luke's beating at the hands of the Sandpeople. Model maker Edward J. Schiess, from Tampa, Florida, seems to be a bit of a revisionist -- he pretends that R2-D2 chose to stick by his comrades rather than selfishly cower in a cave. Nice try, Ed. If you look closely you'll see that the C-3PO figure in the background has had one of its arms torn off. Of course, this dates from a time before Kenner offered a C-3PO whose arms were easily detachable. I love those weird rock formations. I'm guessing they were drawn from a commercial toy or model kit. Finally, here's the diorama that placed fourth in the contest. It depicts the moment in Mos Eisley when Obi-Wan uses the Jedi mind trick to throw the Stormtroopers off our heroes' trail. As you've probably already realized, this is the diorama that was featured on the magazine's cover. However, this shot shows the model from a different angle. It was used in the magazine's interior. The desert Stormtrooper was among the most popular creations of early customizers. When Hasbro finally released an official version, it seemed odd that you could buy one in stores. Funny to remember a time when every Star Wars character, even the lame-o background ones, had yet to be released in toy form. 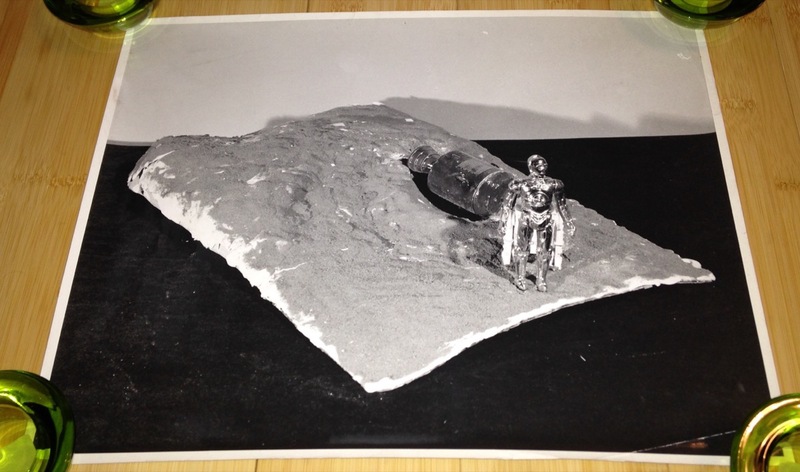 The ground in this diorama appears to have been created using stucco or a similar compound. I love the paper cut-outs used to represent aliens and Jawas. I wonder: Why didn't the creator use Kenner's Jawa figure? 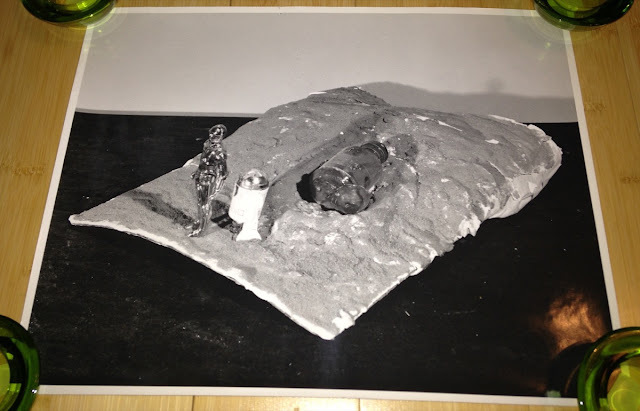 It's possible the Jawa wasn't widely available at the time this diorama was made (mid- to late-1978). The Jawa, Sandperson, and Death Squad Commander were the last of the original twelve figures to hit stores. And while these photos show a few Sandpeople, the lack of Jawas and DSCs is notable. The reverse shows that it was built by Laredo, Texas resident Alberto Ramirez. Apparently, Alberto had time to take photos of his creation but not of himself: his note says "no pix," and his photo is absent from the magazine spread. The inside of the magazine reveals more detail on the contest and its participants. 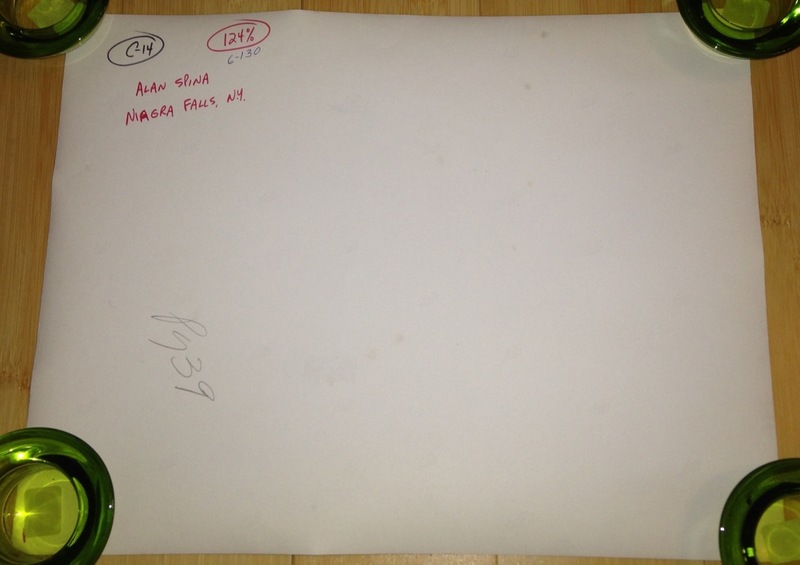 This page of the publication displays Alberto's and Steven's entries in all -- or most -- of their glory. Both of these reproductions derive from the very photos you see above. Alberto received a $100 prize; Steven took home a nifty $50. I wonder if they spent it on Star Wars toys? And here's the page representing the work of Alan and Tim. 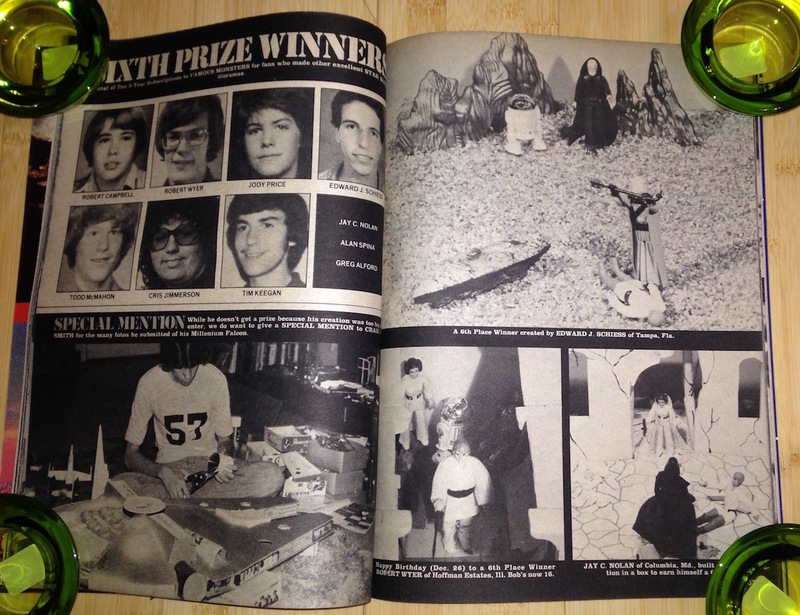 Their entries tied for sixth place, which was good for a three-year subscription to Famous Monsters. That would have taken them right up to the hubbub surrounding the imminent release of Return of the Jedi. 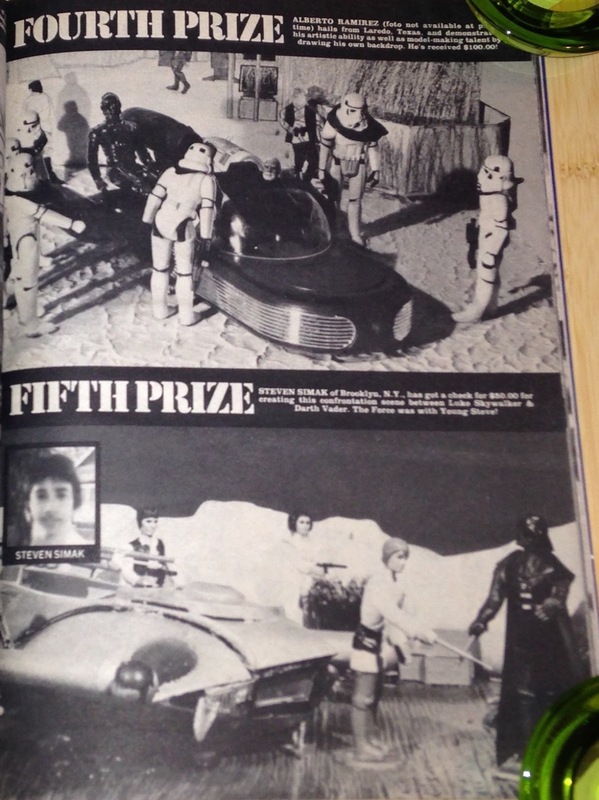 Finally, we have a two-page spread showing Edward's diorama, photos of the sixth-prize winners (Tim and Edward included), and an honorable mention for a guy who built a giant model of the Falcon from scratch. If you're wondering about the two other dioramas featured on these pages, including the one showing a Luke figure wearing a soft-goods garment, I'll get to those in the second installment of this post, which will follow shortly. I was really tickled to find some material relating to a moment at which Kenner Star Wars toys and Famous Monsters overlapped. The magazine was one of the main catalysts for the boom in genre filmmaking that occurred in the '70s, as guys who'd devoured "FM" as kids blossomed into major Hollywood talents. I think it's safe to say that Star Wars, at least in the form we know it, would not have been possible absent the influence of Famous Monsters. And no one is more responsible for the culture of fandom we see around us today than "FM" editor Forrest J. Ackerman. If you're unfamiliar with Ackerman, who is credited with coining the term "sci-fi," I encourage you to read more about him here. 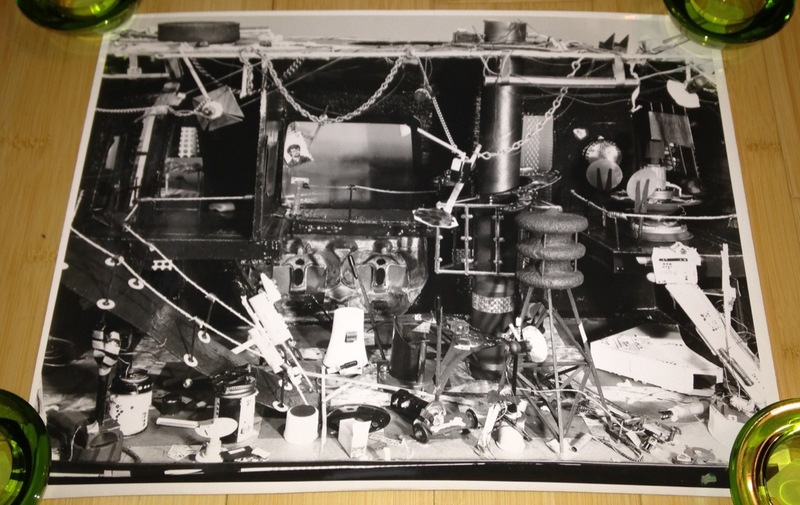 He probably deserves to be credited as the first major collector of science fiction and horror paraphernalia. Yet another article which has captivated me. Superman movie, LOTR Gollum from the Bakshi movie and Battlestar Gallactica - top stuff. The article clearly shows why we are collectors today. 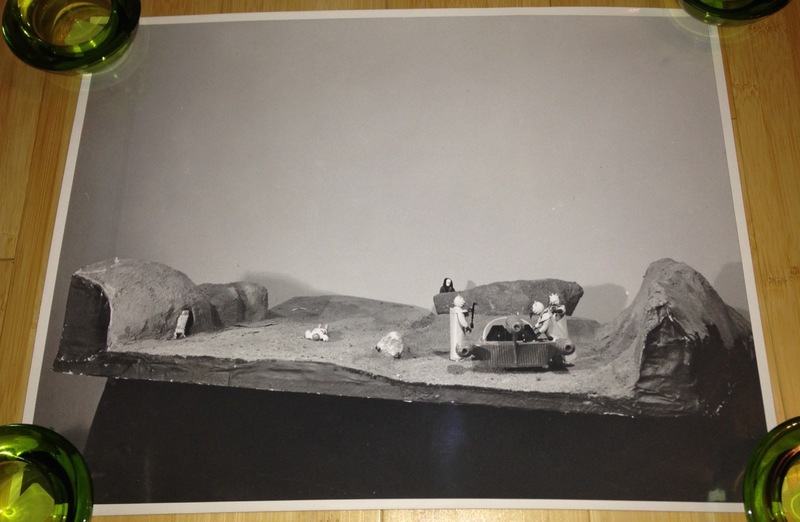 We all made our own scenes and storylines (when was the term diorama coined?) although those guys blew everything I did away. Interesting to see that the sand scenes featured heavily in the entries, could imagine that Owen and Beru's remains would have been a popular one with Luke gazing off in the distance. Would love to have seen some with Splinter of the Mind's Eye influence.